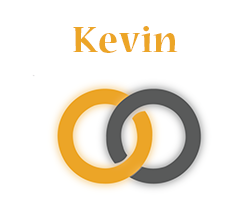 Kevin - SignOn - Connect. Practice. Retain. My name is Kevin. I am 27 years old, born in Ann Arbor, and raised in Howell, Michigan. I grew up in a predominantly hearing family other than my mother, who is deaf too. In my free time, I love golfing, watching football and eating burgers! I really enjoy meeting and working with students on SignOn and seeing their signing skills improve!